As a manager or supervisor, your time is valuable. You need to make sure you can save time whenever possible. 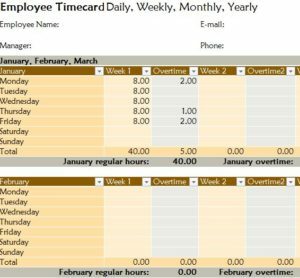 The free Yearly Employee Timecard document is available to help you organize your employees time by tracking every hour of the day. If you run a small business then this is the best tool you can use to get started tracking all this data. You might not have the time or wallet for fancy software that does this for you. Keeping this simple sheet can make all the difference when you have to sit down and calculate the hours and wages of your employees. You can get started with this free template by following the list of instructions provided below. You can download the free template by scrolling to the bottom of the page and following the link that we have provided for you below. Next, Go ahead and make copies of this timecard for all your employees. You can do this by right-clicking on the timecard tab at the bottom of your screen. You can also add the name of your employee to the tab so you can easily tell them apart. The tables display the current month and then the days of the week in the first column. In the first row of each template, you will also see the weeks of the month as well. There is also a space for overtime as well. Each week, you will just list or edit the number of hours they put in. Each table goes over the month and you can see the number of hours they worked for the entire month at the bottom of each table. When you’re ready to move on to the next month, just scroll down to the next table for that employee. You can see how easily this template makes your life. Save time and energy by downloading this free template today!